On the precipice of the Aug. 8 feast day of St. Dominic, local chapters of the Dominican Young Adults (DYA) met on Saturday, Aug. 2 in New York at Molloy College and St. Thomas Aquinas College, in Chicago, in Michigan at Siena Heights University, and even in Kenya, Africa (special appearance by Br. Lorenzo Laorden, OP doing mission work there). Connecting via technology, more than 20 young adults were able to gather nationally without paying a cent! Seven years ago, DYA-USA began. A nation of college students who had attended the College Preaching in Action Conference had met in Columbus, Ohio, to plant the seed of a national group of young Dominicans. They met again in 2008 in Madison, Wisconsin, and DYA-USA officially formed and launched their web site. In 2009, DYA was officially recognized by the International Dominican Youth Movement (IDYM), at the International Gathering in Fatima, Portugal, and IDYM held its International Gathering in Bogota, Columbia in 2013, where two DYA USA members were elected onto the five person International Commission (Sean Mundy from Chicago as Promoter of Communications and Lyamar Diaz-Rodriguez from Puerto Rico as Promoter of Formation). In 2010, members from various DYA groups met at the first National Gathering in Chicago. Many members are excited about the possibility of representing DYA-USA at World Youth Day in Krakow, Poland in 2016, at various world activities for the 800th Jubilee of the Dominican Order, and at the next IDYM International Gathering abroad. The DYA Executive Board felt that it was necessary to find a way to meet nationally, yet allow for young adults to attend without incurring travel expenses. Google+ has designed a way for people in different locations to “hangout” in a video chat room (with numerous other features, including chat, Google Drive integration, screen sharing capabilities, the ability to watch a common YouTube video right in the chat room, and more). With a great deal of tech preparation by Sean Mundy, DYA Executive Board National Coordinator, each local chapter was able to connect. After this, the voting for the 2014–2015 National Executive Board was held via an online form on Google Drive. Applicants sent in a short video introducing themselves and why they want to be on the Executive Board. These were posted on the DYA YouTube Page so the local chapter members could learn about each candidate. In a change in the structure of leadership, the members of DYA USA elected Andrew Abberton (from the DYA Molloy Chapter) as President/National Coordinator, Carissa Rivera (from the DYA St. Thomas Aquinas Chapter) as Vice President/Formation and Membership Chair, Mike Malinowski (originally part of the Molloy chapter, but is working to create a DYA Barry University Chapter) as Secretary/Communications Chair, and Brianna Frazer (from the DYA Siena Heights University Chapter) as Finance/Social Justice Chair. Continuing his leadership will be former National Coordinator, Sean Mundy (from the DYA Chicago Chapter) to mentor the new Executive Board in this transition. Much gratitude was given to the outgoing 2012–2014 National Executive Board, Sean Mundy (National Coordinator), Lyamar Rodriguez-Diaz (Membership/Formation Chair), Katy Somerfield (Communications Chair), and Andrew Vivian (Social Justice Chair) for their two years of service and leadership. Next, a representative from each chapter was able to speak about their progress over the past two years, including numerous acts of service, and to share their hopes and future plans. This insight allows newer or continuing groups to learn about best practices for such a young organization. Unfortunately, due to technical difficulties, members of the International Commission of IDYM were unable to present about their progress, but videos will be coming to the DYA Youtube channel shortly with updates. Sean Mundy helped shed light on some of the work of the International Commission. For example, International Coordinator Jose Alberto de Blas (Spain) visited both the Philippines and the African gathering of Dominican Youth, and Daniel Toledo (Guatemala) and Leo de Laquila (Brazil) visited Colombia and other Central and Southern American countries to speak with the young adults there. Sean Mundy and Lyamar Rodriguez-Diaz will also be participating in the Dominican Laity Congress in Dallas, Texas to speak about DYA and IDYM. In trying to continue the connection between Dominican Volunteers USA and DYA (many young adults participate in both programs), we decided to end with the tradition of singing the Dominican Blessing as a commissioning of its members. Overall, the event was a huge success. With the help of the new Executive Board, we are excited to create new DYA chapters throughout the United States. Existing chapters will undoubtedly continue to make an impact in their local areas through prayer, community, preaching, and service. For more information about Dominican Young Adults USA, visit their web site at http://www.dya-usa.org. When we all connect via Google+ for our National Gathering on August 2nd, we will be electing a new National Executive Board. Essentially Sean Mundy will stay on for a year as a mentor to help in the transition to the new board, then we will elect a President/National Coordinator (will serve 1 yr term, then stay on as mentor for 1 more), Vice President/Membership and Formation Chair (Will serve 1 yr as VP, then assume the Presidency for 1 yr, then advisor for 1 more), Secretary/Communications Chair (1 yr term), and Finance/Social Justice Chair (1 yr term). 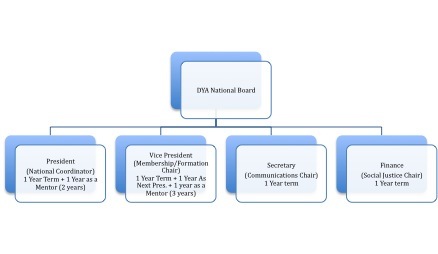 If you are interested in applying, please send a short video introduction (Name, age, college/university/job, hometown/state, and why you think you are qualified to serve on the Executive Board) to dyacommunications@gmail.com. All submissions will be put on our YouTube channel and viewed by all active members before elections are held. Any questions? Please e-mail DYA National Coordinator, Sean Mundy, at dyanatcor@gmail.com. DYA National Online Gathering on August 2, 2014! 5 “And whenever you pray, do not be like the hypocrites; for they love to stand and pray in the synagogues and at the street corners, so that they may be seen by others. Truly I tell you, they have received their reward. 6 But whenever you pray, go into your room and shut the door and pray to your Father who is in secret; and your Father who sees in secret will reward you. How can we pray in public without being like the hypocrites? What do you gain out of personal prayer in private? Want to give to the DYA USA community? As the Board begins planning for our National Gathering this summer, we are looking for dedicated and generous members to pitch in with some extra tasks. If you are interested, please contact one of our board members.